Hi there! This is for my Saturday class but as usual, everyone is welcome to join in. Please post your responses in the comments section below. We were talking about embedded questions in our class. Basically, they’re sentences that have the idea of a question hidden inside of them. They can be actual questions, but they may also be statements. For example, look at the quote from Abraham Lincoln in the picture above. There are two embedded questions in it. In the first part, “I don’t know who my grandfather was” the embedded question is Who was my grandfather? 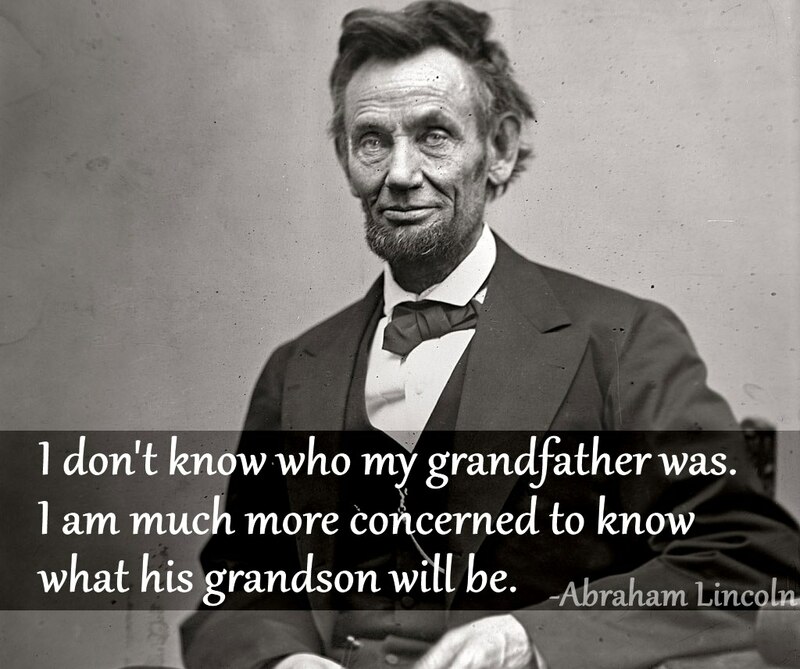 The second one, “I am much more concerned to know what his grandson will be,” contains the question What will his grandson be? When we add a phrase like “I don’t know…” (or something even more complicated like “I am much more concerned to know…”) at the beginning of a sentence, we need to change the order of the remaining words sometimes. If you have more questions, please refer to your book for more information. I’m not sure why embedded questions are so confusing for some people. I was wondering why so many people say it’s cold outside, because it’s actually warm. Try to make sentences that are relevant for you. So, good luck, and tell me if you have any questions. See you on Saturday! 1. I don´t have any idea what the name of my favorite song is. 2. Could you please tell me how far New Zealand is from Costa Rica? 3. I wonder what beach in Costa Rica is my favorite. 4. I wanted to know how the snow is. 5. I was wondering how can be people who doesn’t likes the dogs. 6. I don´t know where my favorite book is. 7. I can´t remember how old my grandma is. 8. I´m not sure where mi next vacation are going to be. 9. I wanted to know how the Tulips are, because in the photos they look perfect. 10. I can´t remember when my last party was. Thanks!!! And see you tomorrow!! Since we also talked about your sentences in class yesterday, you probably know the corrections to make, right? If you have any questions, please tell me. Otherwise, see you in class! 1. Do you know where were they going to travel? 2. I have no idea where they were going to travel. 3. Could you tell me why don’t you want to practice soccer with me? 5. I don’t remember where the error was. 6. Do you know when the next bus comes? 7. I’m not sure where that phone is? 8. Could you tell me what this movie is about? 9. I don’t remember where your girlfriend’s present was. Thanks for your comment, and welcome to the class! I guess since we talked about your sentences yesterday, you may not have any questions. Just remember to switch the word order for #1 and 3, and that #7 isn’t actually a question. If you have other comments or questions, please feel free to ask. Hello!! This is my homework. 1. I´m not sure where my grandfather born? 2. I don’t have any idea how last night was. 3. Could you tell me where the soccer game was? 4. I don’t remember what happened. 5. Nobody knows who really discovered the penicillin. 7. I don’t know what they should do. 8. Can you tell me where the Hospital is? 9. I don’t have any idea if he knows how to drive. 10. I’m not sure who she is. 1. I have none idea where my ball is. 2. I don´t know who my brothers are. 3. Could you please tell me when the plane arrives? 4. I don´t remember where the bus stops. 5. I´m not sure why the baby cry. 6. Can you please indicate me where the next exit is? 7. I can´t remember where the cats hide. 8. I´m not sure where my next food is going to be. 9. Could you please say to him who his father is. 10. I can´t see who your brother is. 10. This is a bit weird…maybe see WHERE your brother is? 1. I don’t know what we did in class last week. 2. I don’t know where my parents are. 3. I don’t remember when the summer classes begins. 4. I’ve forgotten what my brother’s number is. 5. I’ve forgotten who my secret friend is. 6. I don’t remember what time the match begins. 7. I didn’t know who Franz Reichelt was. 8. I’m not sure what the chilliguaros ingredients are. 9. I can’t remember where my cap is. 10. I’m not sure where the class is today. 1) Can you tell me who the inventor of the Internet was? 2) Can you tell me where the bathroom is? 3) I’d like to know what the homework is for today. 4) Can you tell me who Albert Einstein was? 5) Do you know if the test is the next week? 6) I’d don’t know where the cell phone is. 7) Do you know who the president of Argentina is? 8) I have no idea where my mom is? 9) Can you tell me where the beach is? 10) Do you know if the soccer match is today? Great work! Just two changes I’d make: #6 doesn’t need “I’d” (just “I”) and #8 isn’t actually a questions. Good job, though!